Stopped Out… But The Premise Remains Valid! The recent Winning Through Losing Better series talked, amongst other topics, about the importance of pre-acceptance of risk. Pre-acceptance of trade risk means that I'm not overly concerned with the monetary loss and can keep my focus on the process of analysis and effective decision making. My focus remains on process, rather than outcome! Without pre-accepting trade risk your analysis and decision making will be compromised at all times, but especially following a loss. For some people this will result in emotional trades in order to take revenge on the market. Maybe sometimes this will work in your favour. Most often it won't. For others this will lead to hesitation and missing out on any following opportunity, which leads to a spiral of ever-deepening frustration. I thought of this again during the past week, in two occurrences in which I was stopped out (full stop for the first example; partial stop for the second). In both cases though the premise remained valid and the environment and setup warranted a re-entry. The important point here is that this re-entry was a conscious analysis decision rather than an emotional based reaction to the prior loss. You have confidence in both your strategy and your ability to trade that strategy. Your trade risk is small enough to not overly concern you in the event of loss (in fact you could even say that the loss from two stopped out trades must not overly concern you)! Risk is pre-accepted (and in fact even expected, as discussed in the prior article series). 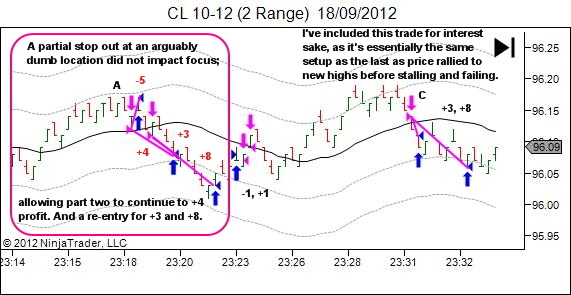 Analysis for the above trade: Note the reducing projection from A to B and C. Note the increasing strength on pullback D compared with E and F. The trend was weakening. Note the weaker rally at G.
My plan here was to take a counter-trend trade short, in expectation of a deeper complex pullback (not necessarily reversal). 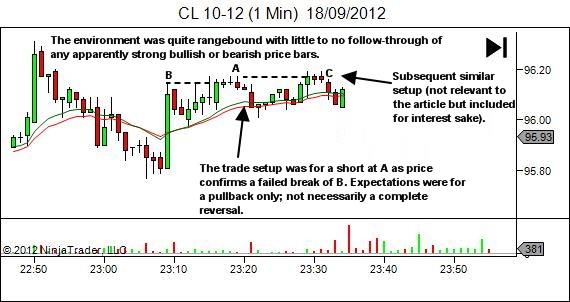 The ideal setup would involve a failed break above C's high. Price did not act like it had potential to make this break though, so I took the earlier entry due to an expectation that the rally was exhausted. 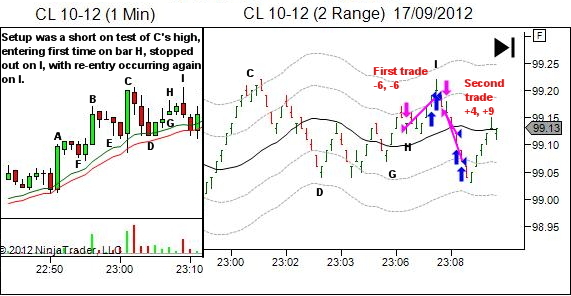 The trade was stopped out as price pushed higher than anticipated (testing right to C's high). Re-entry occurred when the move finally failed as expected. The end result is essentially breakeven. But only because I was able to remain calm, and accepting of the loss. A net result of +1 tick is much better than -12 and a whole bucket load of frustration!